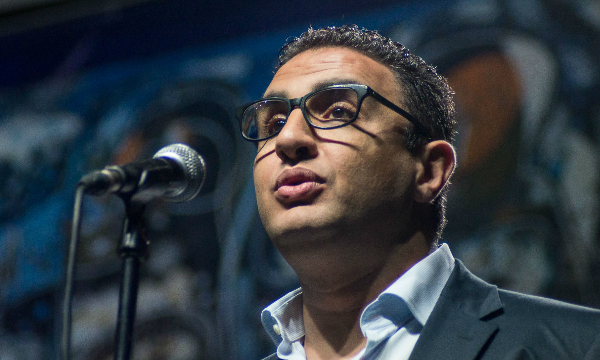 Najwan Darwish is a leading voice in contemporary Arabic literature, working as a poet, journalist, editor and critic. The New York Review of Books has described him as "one of the foremost Arabic-language poets of his generation" and Canadian poet Amal El-Mohtar said Darwish has "a voice simultaneously so passionate and so matter-of-fact that it stops the breath.” Darwish’s life and work will be introduced by returning guest translator Atef Alshaer who has led a number of our recent workshops on Arabic poetry. Atef Alshaer is a lecturer in Arabic Studies at the University of Westminster. He first came to London after completing his Bachelor degree in English Language and Literature at the University of Birzeit in Palestine. He went on to obtain a Masters and PhD from the Faculty of Languages and Cultures at SOAS, University of London and has taught there until 2014. He also writes and translates poetry. His latest translations include poems by the Sudanese poet, Al-Saddiq Al-Raddi.